One thing that all home security systems have in common is the control panel. While there are different types of control panels, with different features and functions, they all have a common goal: allowing you to control your security system with the tap of a screen. Since control panels are so important to your home’s security, it’s crucial to understand the various kinds that are available to you before deciding on a security system to protect your family and home. Here are five different types of control panels to look out for and the benefits of each one. Control panels, like the ones offered by Vivint and LiveWatch, have a clean and very modern design, which makes it straightforward, easy to use and to understand. The interface is a 7-inch touch screen, which works in a very intuitive manner. You can use the panel to arm or disarm your system, control the locks on your doors, add or remove users, and more. You can also adjust how the screen looks, the lighting and sounds, so that it is easier and friendlier for you to use. There are two main benefits to a control panel like this. The first is fairly obvious, and that’s ease of use. You don’t have to spend hours trying to figure out what each button does because everything is on an intuitive touch screen. The second benefit is convenience and efficiency. It is very easy to use in the dark because the entire panel is a screen. Control panels with a cellular link are connected to your mobile phone and are usually wireless. The control panel by Link Interactive has a cellular link and allows you to fully control your security system from your mobile phone too. The benefits to this are twofold, not only can you control your system and monitor everything on the go, from any location, but the panel itself is wireless, which means that burglars can’t simply cut wires to deactivate it. You can also get instant security alerts in real time when something happens, even when you’re not home, instead of waiting for a call from the security company. Another great wireless panel is the wireless Simon XT control panel offered by Protect America and SkyCover. It’s also called the “Simon XT Talking Touch Screen” because of its unique features. It has a graphical interface and you can program up to four touchscreens into the panel. This allows you to create a convenient way to carry out simply actions, like arming the system, activating the panic alarm, checking the status of the system, turning lights on or off, and more. You can also hear voice feedback concerning the status of the Simon XT panel. Some control panels have a damage control feature that provides additional security for you and your loved ones. The control panels activate the alarm or send an alert system if someone damages them or tries to destroy them. Many burglars use the “crash and smash” method when breaking in to a home. They take advantage of the fact that the alarm is not triggered immediately when the door is opened, because the alarm system gives the homeowner a few seconds to deactivate the alarm. Burglars simply use this time to break in and quickly smash and destroy the control panel before it has time to send the signal or activate the alarm. It is a very brute-force way of doing things, but it works in many cases and criminals know this. Having a control panel that protects against these types of break-ins can make a huge difference. Simple and clean control panels may be easy to use and look at, but they’re not a good fit for everyone. Some control panels are more sophisticated, with a lot more buttons, features, and customizations. This can include speakerphone capabilities, a one-button panic alarm, and even a built-in phone on the panel. The benefits of a panel like this become apparent only if you need all of the features and options that they provide, so it really depends on what you’re looking for and what your security requirements are. Those are the main types of control panels you’ll come across when you start looking into home security systems. They are not all standalone, so don’t think you have to settle for one type. You can find control panels that have a touch screen, a panic button, a wireless connection, and are even “crash and smash” proof. It is best to understand what features are best for you, taking into consideration your security needs and the fact that this is something that you and your family will use on a regular basis, so you also want it to be easy for everyone to understand. Another thing to consider is a mobile app. 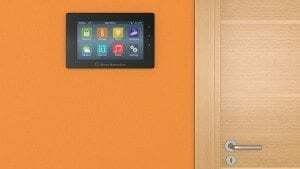 Some security systems, like Vivint, also provide you with a mobile app along with their control panel. You install the app on your smartphone, and you automatically have full control of your panel and security system. This is a great way to monitor the security of your home when you’re away, see what is going on in the house and check in on the cameras, and even make sure you didn’t leave any doors unlocked or lights on. Either way, always remember to read about each security system, the features they provide, and the reviews that professionals have written about them. This will help you understand which company can provide you with the best possible security. Check out our in-depth reviews, covering every aspect of our top-rated home security systems, before making a purchasing decision.